Make my amazing Microwave Mug Pizza recipe in just minutes for real food fast! Homemade Pizza made in a microwave in just a few minutes? Oh yes, and it’s INCREDIBLE! My Microwave Mug Pizza recipe is a serious game changer when it comes to your meals, and maybe life (just sayin’). It is real food, fast, and better than fast food. You will simply not believe the results. How Long Does It Take To Make A Microwave Mug Pizza? My Microwave Mug Pizza is a real meal made using good quality ingredients. This single-serving recipe can be whipped up in 5 minutes, and it’s the perfect solution when you are on the go and want something homemade and satisfying. My mug meals are easy food recipes for any occasion: they’re perfect for lunch, dinner, snack, after school, easy college meals, sleep overs, pizza party, or even Birthday parties! Get ready — it’s really easy! First, use your favorite microwavable mug. Mix up a pizza crust with just a few ingredients you already have on hand (full recipe below!). Then, you can customize your Microwave Mug Pizza with your favorite toppings. I’m a fan of a classic pepperoni pizza, but mushroom is a close second. I even have an easy 5-Minute Pizza Sauce recipe you can make in no time! Now you can enjoy microwave pizza anytime, anywhere. If you are reading this far down the post and are still wondering what can pizza from a microwave will be like then scroll down to the recipe and take 5 minutes to make it. Then later, scroll down to the comments and tell me how much you loved it and share this recipe. 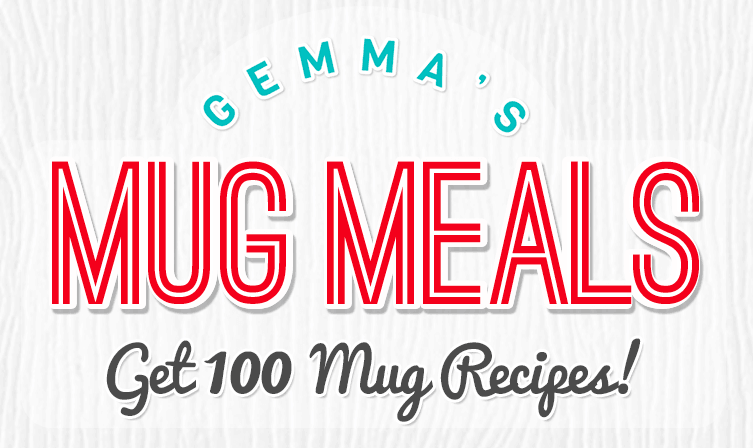 Get more 100 more microwave mug recipes at my Gemma’s Mug Meals Collection page! Have you followed Bigger Bolder Baking on Pinterest? Learn how to make my amazing Microwave Mug Pizza recipe in just minutes. You can add any toppings you'd like and it's faster and better than pizza delivery! Always keep a close eye on your mug while in the microwave so it doesn’t over flow or over cook. Hi,, what can i use instead of olive oil and pepperoni….?? Also i dont have marinara sauce but I have pizza sauce….can i use pizza sauce?? Hi, yes pizza sauce will work and you can leave out those toppings and use any other you like! I’ve recently been diagnosed with a gluten intolerance, and I made this recipe using a gluten free flour (Bob’s Red Mill 1 to 1 baking flour) and it came out delicious. Thank you Gemma for this recipe, it was a quick and easy recipe to whip up! Delighted that you could make it work for yourself, Cindy! I think other Bold Bakers will benefit from your comment. I love making this for work lunches. I sub out the pepperoni for sliced black olives as a personal preference. But it’s so quick and easy! YES, this is one of my favorites too! Delighted to hear you like it! Will almond flour work? I’ve been on keto for over a year and want to modify this! Yes you could try almond flour. I personally haven’t tried so I can’t guarantee. I have an older microwave, 1000 watt. How much more time is needed to cook? This is not a straightforward question! The technology also matters, more modern ones have a different, more efficient way of cooking, mine has inverter technology for instance, which speeds up the baking, and bakes evenly. In an older model you will need to monitor the bake. I suggest you bake for 50 seconds, then open the oven, test the bake, wither with your finger or the back of a spoon, gently press down the center of the bake. If it feels barely firm to the touch it is done, if not continue to bake, 10 second bursts, until it is done. This will teach you about your oven, and you will then know for the future. Is there any way to stop the dough from popping and spreading the sauce everywhere in the microwave? Hi, for this i would suggest just covering it with a paper towel. Hi Gemma, I am an American teacher living in China. I am trying to do some basic meals that taste like home. I love mug meals and my slow cooker is my best friend in winter 🥶. However real pepperoni and cheese is difficult to get and very expensive. I originally found you from searching for coffee creamer.👍🏼❤️ Any suggestions? I live in a smaller city. Gosh! that must be a different experience for you. There are ways to make your own cheese, but the aged cheeses are a long process, and that is where the flavor is. I have recipes here for fresh cheese, cream cheese and mascarpone, and they may be useful for some things, to use with pasta for instance, but pizza flavor is a different thing. A lot of the flavor of things like pepperoni is in the spice. Paprika. Black Pepper.Garlic. Mustard Seed.Fennel Seed.Crushed Red Pepper.Cayenne Pepper. You can make a version of this! use minced chicken/pork/beef or what you can get and blend in the spice to taste, you will be an expert in no time. This can be made into a sausage and fried off, refrigerated and sliced. There is an idea for you! you can make that vegan too. Use tofu for instance as the ‘meat’ to bind the spices. The cheese I cannot so much help with, but this may be a good start to your search for that taste of home. I know what that feels like! See, what matters to me the most is that you learned a lot between the first and second attempts. It is interesting how resting a dough helps a lot, and I hope you figured out why that matters too. It is related to my saying ‘do not over mix’. Over mixing activates the gluten in the flour, in yeast baking this is a good thing, in regular baking it toughens the dough. Resting the dough relaxes the gluten and gives a tender bake. This is most true of pastry type dough. Some baking which includes raising agents can suffer from being left too long. There is a think called a white pizza! This uses a bechamel sauce as the base for the toppings. I would like to try this recipe with Gluten free flour. Can you suggest which one will work best? Almond, Cassava or Coconut ? very few single flours will work well, they almost always need to be balanced with something. Coconut flour is really absorbent, and almond flour not so much, so they make good partners, as the coconut binds. I think for the pizza recipe rice flour would work well, with the addition of perhaps oat flour, potato starch too, though what matters the most is why you need it to be gf. If you are celiac then it is vital that you know the source of the flours is right. A good all purpose plain gf flour blend will really help you, and there are some really good ones out there. Millet, as a grain may suit you too. I think you can experiment. If you choose to use almond flour, with coconut flour, then the coconut element should be about 1/4 of the almond amount. It’s my pleasure, let me know how you go! Could I use Self Raising flour instead of Plain Flour and Baking Powder? Yes, that will work in this recipe. Enjoy! Hi, can I prepare the batter and keep it refrigirated for few hours? Hi, what if I don’t have baking powder? What could I use as a substitute? Yes, you can use 1/8 teaspoon of baking soda. Enjoy!